Previously bank was the only place to go where people could pay a bill, send money, deposit or withdraw their money and make other payments. Time is gone by when people needed to stay in long queues for paying a utility bill or sending and receiving money. Technology has been helping humans in every facet of life and has helped us out in this field as well. With the introduction of technology, things have changed and people have convenient options for their above said needs. The new face of banking is the Omni banking branchless banking which UBL has recently introduced in Pakistan. Its ever growing popularity is the proof of its convenience to the users. By now UBL Omni branchless banking has reached to more than six hundred cities of Pakistan. For a layman understanding Omni offers you all what you expect from a bank but truly speaking it is more convenient than a bank. Most important thing is its timings which is not restricted like a bank that usually is 9 am to 5 pm. You can make utility bill payment, send or receive money till as late as your nearby Omni Dukaan is not closed. Omni account user can deposit and withdraw cash, make utility bill payments, send or receive money, purchase mobile card vouchers, make postpaid mobile bill payment from any branch of Omni which is near you. You can operate your account from anywhere in Pakistan. Suppose you opened an account from Lahore where you work and now you have come to Multan, you can operate your account from here as well, though the charges of transaction would be slightly higher. Telenor Easy Paisa is the only competitor UBL Omni has got in country in this field. Both of them are offering almost same kind of services still there are some differences which you might be interested in knowing. Let’s have a quick look over it. People need to send and receive money across Pakistan and transaction charges are the important thing which needs to be discussed first. So UBL offer its customers lower rates for sending money than does the Easy Paisa. Though difference is not huge but still it considerable thing if both these service providers are in your proximity. Easy paisa has lot of branches in Pakistan but they are limited to around 450 cities only, as far as UBL Omni is concerned they have spread themselves to as wide as more than 600 cities in Pakistan. No doubt, UBL Omni and Easy Paisa both have brought a revolution in banking needs of people. Easy paisa previously had a limit of sending money which was just 10000 rupees in one month using one NIC. Users were facing problems as the maximum limit of transaction in a month was low. Easy paisa recognized this weakness in time and they have now increased it significantly. 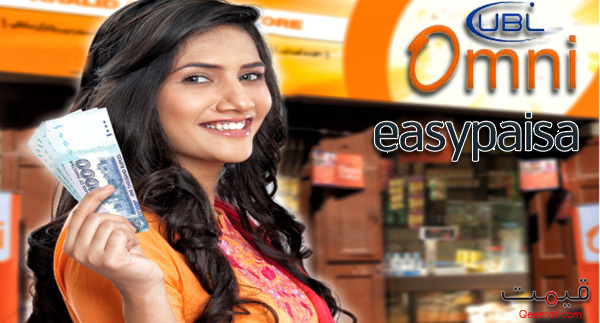 Omni initially had an advantage over Easy Paisa as Omni was offering account service which Easy Paisa lacked. Omni user could deposit and withdraw money from any Omni Dukaan just like a regular bank. But now we have seen that by introducing Easy paisa mobile accounts it has realized its weakness and overcame it. Easy Paisa mobile account offers you more of a freedom than you could imagine. Having a mobile account you can operate your account from your mobile and can make transactions sitting in your home. You can pay bill, send money to other mobile account holders, recharge your mobile account via easy load and even pay the post paid bill of your mobile phone. All you need to have is a mobile number along with your NADRA registered NIC and you can enjoy using mobile account. Yes, it is that simple! You are wrong if considering that Easy Paisa would be charging big amount for this mobile account service. There are no charges for most of the services and for others there are very nominal charges. Till now Omni users could use their account with merchants or banks only but Omni has now introduced No Name debit cards which could be used as a regular ATM cards in all the ATM machines and the user can avail all the facilities which he can have using Omni Dukaan. UBL Omni sees their card to be used over internet as well for online shopping, which we can expect to be on the go in a short while. With No Name debit cards enjoy great facilities and don’t pay big fee for it. Yearly services charger for Omni’s debit card is as low as 150 rupees. Go to any Omni retailer show him you original NIC and after filling a simple for you will be allotted your debit card which you can activate yourself be calling their helpline. You would never have imagined that banking could be that simple but for now it is, indeed! kya ma ubl omni account ma pasy jama kar skta hun jasy k ksi bank ma hty han agr han to monthly kitny?